Assam Governor Prof Jagdish Mukhi during his Dhubri visit last month expressed his grave concern over the filthy state of Dhubri town and had instructed the district administration and civic body as well to clean the town within one month, but the Governor’s instruction failed to get any result. The Dhubri Municipal Board, established in 1883, which has already completed 135 years of its existence and the one among the oldest civic bodies of Assam, has failed to allocate a piece of land for a garbage dump, as a result of which, the entire town is full of filth and garbage strewn here and there, except for a very few areas. The civic body used to dump garbage and other plastic waste at Mela Maidan field located on the bank of river Brahmaputra causing serious health hazards and pollution. Although the district administration has imposed a total ban on the single use plastic across the district since August 22 and directed all the civic bodies including the Dhubri Municipal Board to strictly implement the orders, but the the tea-stall owners and shopkeepers as well as the common people have still been seen using rampantly the plastic cups, plates and bags and throw it on the street due to absence of proper dustbins in their localities. Many shop employees throw garbage on the street itself as the dustbins placed by the authority concerned are narrow and of poor quality. As there is only one dustbin in front of the Dhakai Masjid for the entire market area of the town is a matter of serious concern for the shopkeepers as well as the general tax-paying public. The garbage, dumped just under the signboard of the office of the Superintendent of Sales Tax located hardly at a distance of 200 metres from the office of the Municipal Board, Dhubri, gives a clear picture of the utter negligence shown towards the people by the authorities. Roaming of stray cows and bulls freely in the town areas has become another matter of concern for the common people. 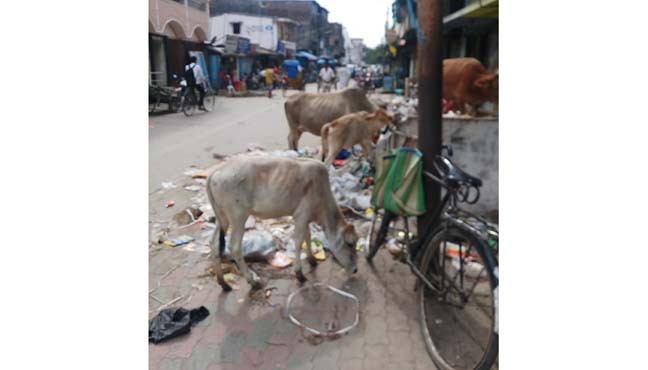 Dhubri Deputy Commissioner Ananta Lal Gyani has taken a number of initiatives in order to clean the town but has failed to achieve the goal of cleanliness. During a review meeting held with the officials of Dhubri Municipal Board last week in the wake of Governor’s next visit likely to be held in the first week of September, the DC has strongly directed the civic authority to clean the town at any cost. And after the strong instruction of the Deputy Commissioner, a team of officials comprising both Dhubri Municipal Board and district administration respectively led by Executive Magistrate S Chetri had visited the market areas on Tuesday and imposed fines against the offenders who throw garbage on roads and also instructed the shopkeepers to keep clean their surrounding areas in future.